OSIBISA exploded onto the music world in 1971 with a pulsating and vibrant sound that was to engulf the post 60s rock scene. Their first albums were as distinctive for their famous ‘flying elephant’ fantasy artwork covers by the great ROGER DEAN as they were for their exciting music. Translated from Ghanaian OSIBISA means ‘criss-cross rhythms that explode with happiness’. The bands percussive influence soon began to manifest itself within the music of their contemporaries. OSIBISA’S use of poly-rhythms and percussive breaks were to be an integral feature of the deep house scene in the 90s with remixes by the famed DJ DAVID GUETTA. OSIBISA’S unique fusion of African, Caribbean, Rock, Jazz Latin and R&B paved the way for other potent music forces such as BOB MARLEY and the emergence of African music in the 80s. Indeed OSIBISA are now seen as the godfathers of World music. One of the important reasons for OSIBISA’S enduring success has been their highly energetic and extravagant stage shows. 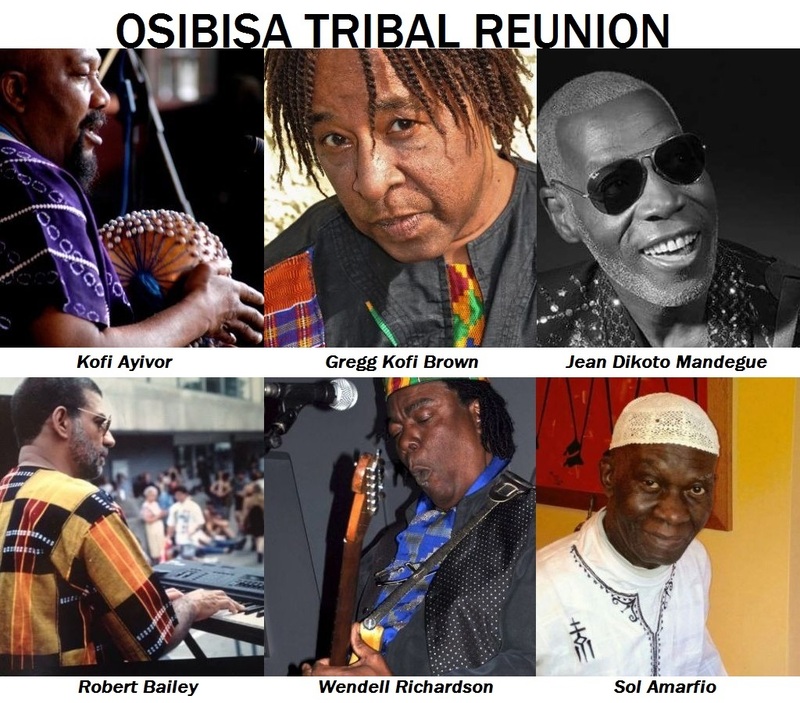 Recent highlights of OISIBISA’S endless touring schedule include performances in India, Japan, Morocco, Australia, and Europe. The new millennium has seen a re-emergence of OSIBISA playing at prestigious UK festivals such as WOMAD and the CORNBURY and supporting SANTANA on tour in Austria. With MASTER’S AT WORK’S LOUIE VEGA’S reworking of OSIBISA’S ‘Music for Gong Gong’ going ballistic in clubs in New York and Miami their influence continues to this day. Ghanaian founder member – Sol Amarfio – (vocals and percussion) Founder of Osibisa and writer of such classics as ‘WOYAYA’, ‘WELCOME HOME’ & ‘SUNSHINE DAY’ . Kofi Ayivor – (percussion and vocals) wrote Osibisa classics like Kelele. Recorded with Eddie Grant & produced UK band Hi Tension. Jean Dikoto Mandegue – (bass and vocals) played bass on Osibisa classic albums like Heads & Superfly TNT.